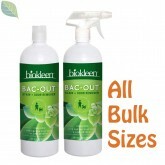 Biokleen Multi-Surface Floor Cleaner (available here in Large Sizes) uses Bac-Out Technology to clean, shine and deodorize by digesting dirt, oils, grease & other organic soils the natural way! A blend of live enzyme cultures, citrus extracts and plant based surfactants this Natural Multi-Surface Floor Cleaner, does what it says it does... it cleans a whole variety of water safe surfaces (see list below). All Natural; No artificial fragrance, colors or preservatives Will not leave a residue if wiped before dry. Just spray, let sit for 5-10 minutes & wipe or mop thoroughly (don't let sit on surfaces not impervious to water). Not just for floors! Use to clean any wet cleanable surface the natural way, including but not limited to: Floors (hardwood, ceramic, laminate, vinyl, cork, linoleum, tile, etc), Walls (painted, paneling, stucco, etc), Counter Tops (ceramic, marble, granite, stone, etc), Showers (tile, fiberglass, glass, acrylic, etc), & much more. Use your imagination. 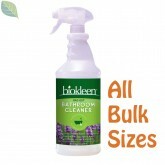 If Biokleen Multi-Surface Floor Cleaner dries on surface before wiping or mopping and residue is detected, simply wipe with a damp towel. This Natural Multi-Surface Floor Cleaner: Does not contain any: Chlorine, ammonia, butyl, glycol ether, SLES, DEA., or EPA priority pollutants. No materials listed by the ACGIH as hazardous.